Breadsmith was founded in 1993 with the philosophy that ‘we have old-world values in a new world.’ We make the finest artisan breads in the time-honored traditional way, by hand without additives and preservatives, using only the best ingredients. Our dough is never frozen and our breads are baked in a five-ton, European hearth stone oven. We also make specialty breads and a wide range of cookies, muffins and sweets. Breadsmith artisan bakeries can now be found throughout the nation, and our franchising office is located in Whitefish Bay, Wisconsin. We have received accolades for our European-style breads including top honors from Bon Appétit magazine, Modern Baking, International Culinary Salon, National Restaurant Association and “Best of” awards throughout the country. We're committed to being actively engaged in each of the communities we serve. Through partnerships with local non-profit organizations, we demonstrate our commitment to community involvement through product and gift certificate donations, sponsorships of local events, and community fundraisers. Our bakeries also take advantage of locally sourced products such as honey, fruits, and vegetables when making their baked goods. In addition, each Breadsmith location donates its unsold baked goods to local food pantries at the end of each day. 1993: Breadsmith’s founder, Dan Sterling, opened our original Breadsmith bakery on Downer Avenue in Milwaukee, WI. 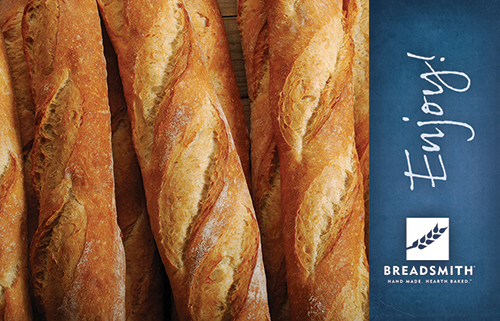 Based on its success and the popularity of European-style breads, we began franchising our artisan bakery brand to local owners and operators across the nation later that year. Early-to-Mid 1990’s: We dramatically expanded the availability of our products by offering our baked goods to highly respected local restaurants and catering companies. By the late 1990’s, our artisan breads could be found in specialty grocery stores, farmers markets, and other locations. 2002: During a time of rapid expansion and growth, we started importing our five-ton European hearth stone ovens and mixers made to our specifications directly from Italy. We also started providing our local bakeries with highly-specialized maintenance support services to ensure that these important pieces of equipment functioned properly. Early-to-Late 2000’s: In order to satisfy the varying taste preferences for our bakeries across the nation, Breadsmith developed hundreds of different product recipes. We now feature more than 300, including several developed during this time. Summer 2014: One year after we celebrated the 20th anniversary of our first bakery, we opened a newly designed bakery in Whitefish Bay, WI. The updated layout and design elements were selected to reflect our “old-world values” in a modern setting, while meeting the needs of our growing artisan bread business. Winter 2014 – Spring 2015: We were warmly welcomed to two new markets, Brooklyn, NY and Oro Valley, AZ. More than 30 Breadsmith bakeries can now be found in 16 states, each providing locally customized menus. 2016: Along with several other notable brands that “exhibit a strong promise of potential growth…,” Breadsmith was named to the list of “Top Ten Emerging Brands” by Fishbowl, a leading provider of restaurant marketing software. Breadsmith will continue delivering the highest quality, made-from-scratch baked goods using time-honored baking techniques, while serving each community in which we operate.